Outside is with a front zipper pocket and a zipper pocket on the back Inside . Reliable forwarder can be provided for shipment if needed. F. Special marketing support for new customers to develop the market. G.
Can provide customer more professional service and suggest. Also have ceritifacte like WCA,ISO9001,ISO14001. 4.We have execellent team design and develop product. 5.24hours online,competitive price,fast delivery and good after sale service. 2015 new quality leather briefcase for man wholesale Laptop bag business man bag file folders Workshop Quantity: 1.Minimum order quantity = 5 2.Accept retail, small order, big order and mix order 3.More quantity, more discount Price: The more you order ,the lower price you will get. we accept send back the goods or return money, please confirm the size ,color and style when placing order. Contact us If any items get your interest, please send feedback to our email or chat on trade manager. 4 YRS Shenzhen Xinghao Leather Co., Ltd. 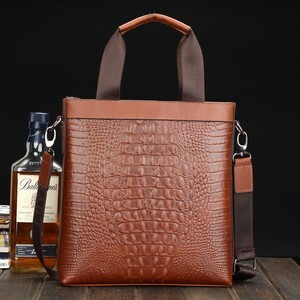 Product Features Latest design real crocodile skin men's briefcase Art. No. XT998 Style Briefcase Size L33 X H30 X D9cm (Drop 14cm) Material Real crocodile skin ( Siam Crocodile) and Soft Nappa leather Lining High quality soft nappa leather Features &bull; Top YKK zipper closure &bull; Front extra zipper pocket &bull; Luxury quality hardware &bull; Interior features zipper pocket, phone and doc. pocket As a reputable manufacturer in Guangzhou of mailand China, We specialize in design and production of exotic handbag for over 10 years! 2 YRS Shenzhen Zhongmin Bags Co., Ltd.
1 Our manufacture mainly product genuine leather bags,leather wallets,leather belts and luggages. Our mainly product genuine leather men's bag,leather men's wallet,leather men's belt and luggages. If you want to change the logo,please send you own logo to us,and we will give an quotation to you,then we will product the sample for you. Sample Policy: Our professional R&D team releases many new styles regular to satisfy market demands. 4.Shipping cost depends on the shipping method,product quantity,weight,carton size and your area. Although Sample is charged and freight collect, but Sample fee will be refund 1 times if the qty over 200 pcs. , on request MOQ 500pcs Products feature: 1. High quality material, which owns better performance and longer lifetime. Sample cost It depends on the materials (sample cost are refundable in formal order) Mass production time: 25-40days(acccording to qty. R&D Service Our professional R&D team can provide suggestion about latest trends, new technical and materials, we can make you sample quickly and accurately according to sample, artwork or just your ideas. 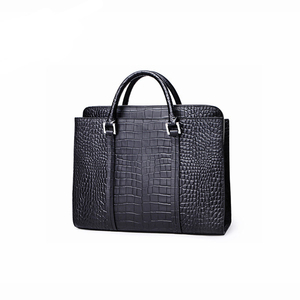 1 YRS Baoding Nalun Leather Goods Manufacturing Co., Ltd.
Heyco black luxury exotic animal skin men's real alligator crocodile leather briefcases Style handbag Model no. CRHB-M005 Material Genuine crocodile leather Lining cow leather Color purple,customize color Size Custom size ( A s the handmade item, there might be a little size deviation. And you can also provide your design and tech pack to us; we make the product as your request. 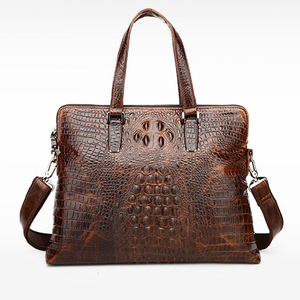 1 YRS Baoding Chuanye Bags Manufacturing Co., Ltd.
5 YRS Guangzhou Qialino Trading Co., Ltd.
Alibaba.com offers 337 crocodile briefcases products. About 42% of these are handbags, 35% are briefcases, and 6% are laptop bags. 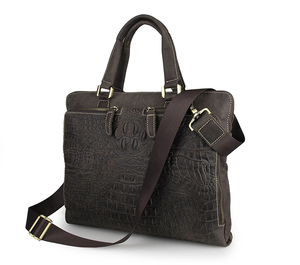 A wide variety of crocodile briefcases options are available to you, such as genuine leather, pvc, and pu. You can also choose from hard bag, soft bag. As well as from brown, black, and red. And whether crocodile briefcases is paid samples, or free samples. 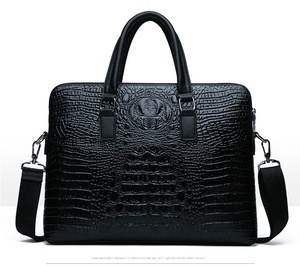 There are 337 crocodile briefcases suppliers, mainly located in Asia. 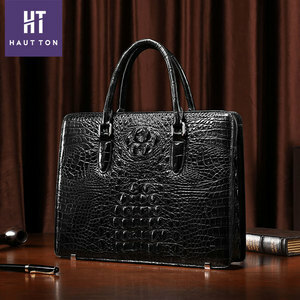 The top supplying country is China (Mainland), which supply 100% of crocodile briefcases respectively. 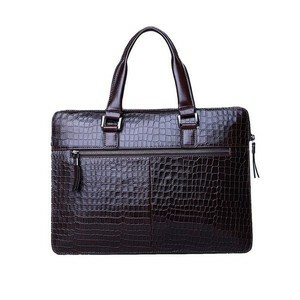 Crocodile briefcases products are most popular in North America, Western Europe, and Eastern Europe. You can ensure product safety by selecting from certified suppliers, including 126 with Other, 58 with ISO9001, and 19 with BSCI certification.